When Did Buddhism Begin, And What Does it Teach? The teachings of Gautama Buddha first spread across the Indian Subcontinent and beyond more than two millenniums ago. Massive statue of the Buddha at Mahabodhi Temple in Bodh Gaya, India, where the Buddha was said to have found enlightenment under a Bodhi tree. Buddhism is the name of a religious belief set and conceptual practice. Buddhism began in India but is now practiced by many of the inhabitants of Sri Lanka, Myanmar, and Thailand, where it is often called Southern Buddhism. The followers in Nepal, Tibet, China, and Japan, meanwhile, are said to be adherents to Northern Buddhism. The total number of Buddhists around the globe today stands at around 500 million followers. Buddhism originated from the teachings of Siddhartha Gautama, the eldest son of the King Suddhodana, ruler of Kapilavastu, who lived sometime between in the 6th and 5th Centuries BC in the area between Benares and the foothills of the Himalayas (modern-day northeast India). 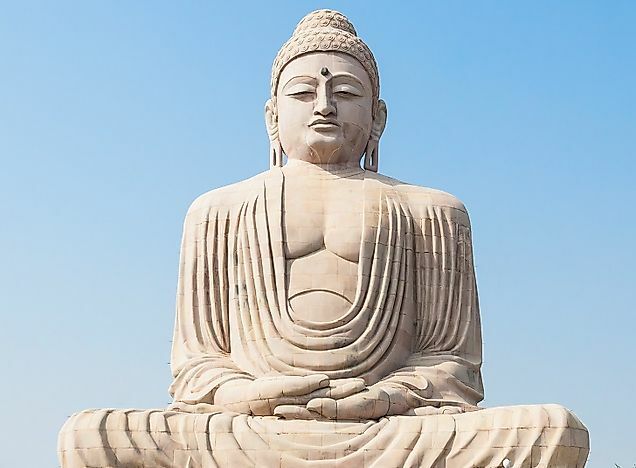 The historical Buddha, Siddhartha Gautama, was born in the Shakya group of the kshatriya caste in the country of Magadha (sometime between 546 and 324 BC.E. ), in the southern part of the Lumbini region which today belongs to Nepal. Buddha is also called Shakyamuni, after the fact that the sage belonged to the Shakya clan. Having a comfortable life in the palace of his father, a young man Siddhartha increasingly collided with the harsh realities of life, and concluded that human life is associated with grief and suffering. He gave up life in the palace, and began to lead an ascetic life with the forest-dwelling hermits. Later, he came to the conclusion that going out of one's way to live in austerity was wrong as well, and that he should walk upon an intermediate path between self-indulgence and self-restraint. During a time of meditation under a Bodhi tree, he decided that whatever it took, he would find the truth. Then, at the age of 35, he attained "enlightenment". He became known as Gautama Buddha, or simply Buddha, which means "the awakened one" or the "enlightened one". The remaining 45 years of his life he extensively traveled across what is now India, teaching his followers and disciples. Over the next 400 years the Buddha's followers formed many different paths or early Buddhist schools called Nikaya, among them the teachings of Theravada was substantial, also numerous branches of Mahayana. Dukkha - life is always accompanied by sufferings. Samudaya - the source of all existence lies in passion and lust. Nirodha - to rid oneself of the rotating wheel of birth and death is only possible through the destruction of lust. Marga - one can achieve this by climbing on the subsequent four steps to Nirvana. The first step is the awakening of the heart. When the shutters fall from the eyes of the believer, he learns the great secrets of sorrow, which are inseparable from life. When this term refers to Buddha, he himself becomes the first step on the path to salvation. The second stage consists of the liberation from impure thoughts. To reach the third stage, the believer must get rid of all evil desires, and remove themselves from ignorance, doubt, heresy, malevolence, and irritability. Mortifying one's flesh through various privations is seen as superfluous, and the greatest attention should be paid to the purification of the soul from evil thoughts. The climax of the entire life, according to Buddha's view, should be found in all-encompassing compassion. The true education and true freedom of a person is only to be found in love. A believer, imbued with love, reaches the last stage. From there, he can break the chains of ignorance, passion, and sin, and thus save his soul as he or she is coming close to Nirvana, and staying outside of the confines of material existence. The mysteries of the future and the past life are opened up to enlightened believers, and they are forever freed from the breed of its consequences, which culminate in destruction and death. Later, Buddhism introduced the noble Eightfold Path, called Arya Ashtanga Marga. The main textual sources to learn of the life of Buddha are the following: "The Manual of Buddhism" was published in 1860. 2) The "Mallalingara Wouttoo", written in the language of Pali, with the time and author being unknown, has an English translation of the work entitled "The Legend of the Burmese Buddha", which was published in 1858 by Bishop Bigandet. 3) The original comments of Jataka in the Pali language, written in Ceylon in the 5th Century and published in 1875 in Copenhagen. 4) The latter's translation into English under the title "The Romantic Legend of Sakya Buddha", compiled by Bilem with a Chinese translation of Sanskrit works included which were called "Abhinishkramana Sutra". 5) The Sanskrit work "Lalita Vistara", the date and author of which are both unknown, and the text of this Sutra first appearing in Calcutta in a volume entitled "Bibliotheca Indica" (name kept as in original). This has been extensively translated from Tibetan into French as well. Furthermore, southern collections of tales about Buddha and his teachings called the Tripitaka were compiled in 250 BC at the council in Pataliputra on the Ganges, which was assembled by the King Ashoka. A similar, northern compilation was approved at the beginning of the First Millennium AD at the Council of Yalandare in Kashmir by the powerful monarch Kanishka. In the course of time, Buddha's followers formed many different paths or early Buddhist schools called Nikaya. From among them, the teachings of Theravada Buddhism came to have the most substantial following, followed by numerous branches of Mahayana Buddhism. Hotei (830 A.D. - 902 A.D.)- A Chinese monk from the Chan and precursor to the Zen Buddhism school. He was a person who gave the Buddhist religion a turn that became quite popular in the Western world. King Ashoka (304 BC - 232 BC) reigned over all of South Asia and beyond due to the many military invasions led by him. He controlled all of present day India, Nepal, Bangladesh, Pakistan, Afghanistan, and Iran. He renounced all violence after becoming a Buddhist. Sanghamitta was the daughter of King Ashoka. She was a nun who spread the Buddhist Order to Sri Lanka, and brought with her a sapling from the original Bodhi tree at Bodh Gaya, laying a path to spread Buddhism outside of India and into the furthest corners of Asia and beyond. Nagarjuna (150 AD - 250 AD)- Indian philosopher and founder of the Madhyamaka School of the "middle path". His major contributions were the development of the Doctrine of Emptiness. Anagarika Dharmapala (1864-1933) was born in Sri Lanka and brought up in Christian traditions. He was the translator for the first Theosophical teachings of Madame Blavatsky and Colonel Olcott. He derived the essence of Buddhism from their writings, and became very devoted to the teachings. He visited Bodh Gaya, India in 1891, and observed the deplorable condition of the Mahabodhi temple. This prompted him to establish the Maha Bodhi Society, an organization working towards the preservation and restoration of the most famous Buddhist temples which attract tourists and truth seekers from around the world. Dalai Lama, Tenzin Gyatso, (a Geshe, the equivalent to a Ph.D. in Buddhist Studies) the 14th and current Dalai Lama of Tibet (1935-Present) is the religious, spiritual, and political leader of Tibet, though currently in exile, living primarily in McLeod Ganj, India. He was awarded the Noble Peace Prize in 1989. Thailand, Cambodia and Myanmar are the countries with the highest proportions of their respective inhabitants practicing Buddhism. The same is true to a lesser degree for many of the other countries of South and East Asia, varying their numbers of devotees between 70% and 45% in each given country in the region. In Indonesia, Malaysia, and Philippines, other religions have largely overtaken the faith, yet Buddhism is still present and practiced by 7% to 15% of their respective populations. Indonesia claims the world's largest Buddhist monument, the Borobudur, consisting of heightened stupas, stone-made capsules with Buddha statues inside each. Countries in the Western Hemisphere have also embraced Buddhist teachings to some extent, and it paved the path in the West for many Buddhist-oriented educational entities and scientific communities to emerge over the past couple centuries. Persecution of Buddhists by militaristic Imperial Japan happened when that country led a series of invasions into other Far East countries prior to World War 2. Another example of such persecution has been seen in Myanmar where, after a coup led by military elite took over, there was sparked the intimidation, torture, and murder of numerous Buddhist monks. When certain ideology proscribes figurative images of sentient beings, often the eyes, noses, and mouths of these statues have been mutilated by those opposing Buddhism. This has happened many times, especially in the cases where ancient Buddhist holy monuments are located in territories with predominantly Muslim populations. Prior to vandalizing the Buddhist Aspara statue in Xinjiang Uyghur in China, the Muslim opposition proclaimed it as being an alien cultural symbol. Strongly influenced by the Communistic ideology of severe reproach for religious dogmas, China and other Communist regimes across the Asian continent have over the past century implemented restrictions towards Buddhist teachings, though damage to monasteries or monuments was uncommon, and many were preserved for their significance to national heritages. What Are The Major Schools Of Buddhism?